Acquario Villa is a wonderful self-catering rightfully sited between Paradise Sun and La Reserve Hotel in the Cote D’or area on Praslin Island. Guests can enjoy live night entertainment at the hotels during week days as well as weekends. This small establishment is also set in the vicinity of a dive centre simply ideal for visitors who enjoy exploring marine life. Another feature located just a few minutes’ walk from Acquario Villa is the breath-taking Cote D’or Beach. About 1.5 km from the cosy establishment is the Anse Lazio Beach; one of the most beautiful beaches in the World. Cote de MerCote D’or as a sub district is generally recognized as the springboard for those who wish to visit other smaller islands near Praslin such as Cousin, Aride, Curieuse, Coco and Sister Islands. Praslin Island is the home of the Vallee Mai, one of two UNESCO World Heritage Sites found in Seychelles. 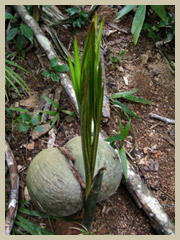 It is notably known for having the Coco de Mer – the world’s biggest nuts growing in its natural habitat. Within the Vallee de Mai there are other endemic flora and fauna such as the Black Parrot and screwpines. This world heritage site is about 4.5 km from Acquario Villa.